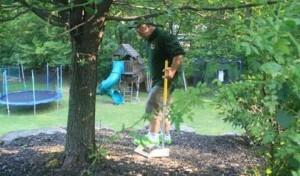 Scooper in hand, Kevin Mahoney scrutinized the dew-sopped lawn with the intensity of a pirate seeking buried treasure. The 39-year-old Valley View Lane resident was looking for booty, but of a more, uh, ripe sort. Mahoney is the owner of DoodyCalls, a pet waste disposal franchise whose employees boldly go where pet owners fear to tread, especially in bare feet: The back yard.